Is Storage Getting Tight at Your House? Consider Portable Garages. Christmas is coming, your storage shed is getting fat. If you’ve noticed that you have a lot of gift items taking up more space than you have available, you may need a new solution. It’s always so much fun to buy people the perfect gift that they will love and enjoy, but having a place to store these items before you give them away can be a real headache. Plus, every holiday season brings with it the influx of new fun items for you and your immediate family members. You will have to make a permanent place in your home for the new gifts that you receive as well. If you are struggling to make extra room, you can invest in portable garages. If you already have an attached garage on your home, a portable garage would free up your attached garage for storage while you parked your car in your portable garage. Setting up a portable garage is a little like adding another room to your home. It gives you lots of flexible space that can be used for multiple purposes. Portable garages come in many different shapes and sizes. You can purchase a rounded portable garage, or you can purchase a portable garage that comes to a peak at the top. You can buy them in sizes that will fit multiple cars, or even buy portable garages that are large enough to store a boat or RV. For more information on all of our portable garage options please contact us. This entry was posted in portable garage, portable garages and tagged portable garage on January 14, 2016 by Canopies Tarps. Are you feeling confined in your living space at home? Then chances are high that you’re simply storing way too many things inside your house. Ready to take back some of that space? Invest in portable garages to allow for a more spacious home. Is your family into decorating for the holiday seasons? Then you probably have a lot of items that are only used for a limited amount of time each year taking up space within your home all year long. However, because you do use them each year, it’s not going to make sense for you to get rid of them anytime soon. But instead of putting up with those items inside your home the entire year, how about placing them in a portable garage? This will allow you to hold on to the seasonal items without having them take over your home. Do you have sentimental items that you can’t quite bring yourself to part with right now? Are those sentimental items not actively being used on a regular basis? Then do yourself a favor and move such sentimental items to a portable garage. Doing so will allow you to keep the sentimental items without cluttering up the home. Not sure what items would count as sentimental items that aren’t actively being used? Stuff like old baby clothes, old journals and diaries that you’re not currently writing in or reading, and various knick knacks from your childhood would all fall into this category. So if you’ve got them contact us to get a portable garage to store them. This entry was posted in portable garage, portable garages and tagged portable garage on August 7, 2015 by CanopiesAnd Tarps. If the Bloomberg statistics are correct, now might be the time to get a home of your own, before demand exceeds supply. As it stands, Realtor is already reporting a decrease in housing availability nationwide and affordable rentals are starting to go fast as well. Therefore, investing in a home may prove the wiser of the two options in the long-term. Regardless of whether you decide to rent or buy, consider utilizing portable garages. They are the perfect way to store your personal belongings while moving from the marital home to your happily single pad. Plus, portable garages can stay with you no matter where that new life takes you in the future. For example, if your new lifestyle involves big boy and girl toys, our portable garages have you covered. They are roomy enough to store boats, recreational vehicles, bicycles, motorcycles and scooters. You can also use them to tuck away your unmentionables when company unexpectedly comes to call for an extended weekend. 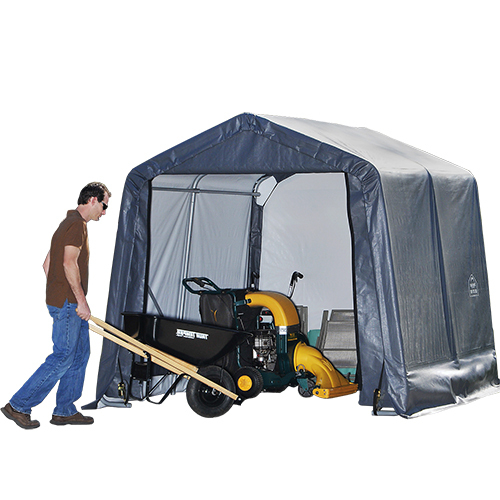 We’ve even seen our portable garages used to house seasonal supplies for entertaining. The list of examples includes barbecue grills, pool chairs, picnic tables, sun umbrellas, lawn darts and cute strands of solar lights that are meant to hang off of summer awnings. To learn more about our portable garages and how they may benefit the newly divorced, please contact us at Canopies & Tarps today. We can help everyone find the right portable storage to suit their needs now and in the future. This entry was posted in portable garages and tagged portable garage, portable garages on February 19, 2015 by CanopiesAnd Tarps. Whether our nations groundhogs predict more snow or an early spring, it doesn’t matter. People should still consider buying portable garages before the official start of spring. Why? Well were glad that you decided to ask because todays post is all about reasons why its important to buy one before the first day of spring. Incidentally, its set to happen on Friday, March 20th this year. So, check out our reasons now and then let the countdown begin! You know that old adage about lambs, lions and spring, right? Most folks talk about watching out for days when the weather is like a lion. Although they can certainly be brutal, lamb-like weather can cause damage to motor vehicles and outdoor items too. For example, mild winds can toss pollen around and UVA rays can discolor surfaces. 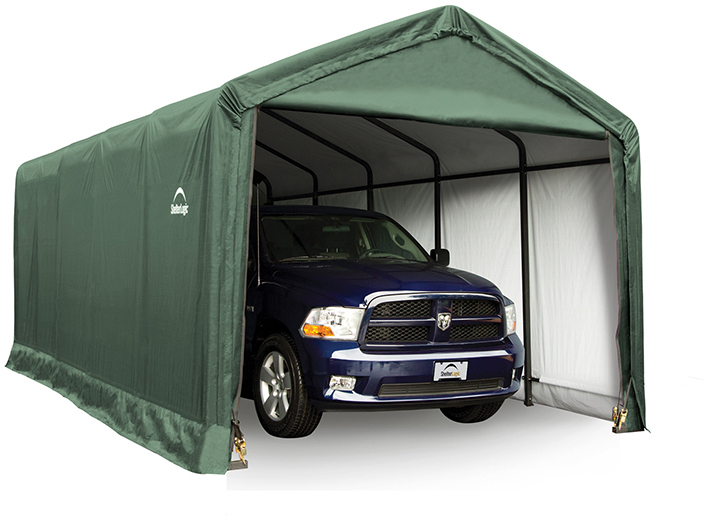 Portable garages will shield items from both. Plus, having portable garages on hand before March will give property owners the spring cleaning advantage. After all, they can be used to clean out seasonal rentals in highly competitive real estate markets and store items during minor renovations. They may also appeal to potential renters and home-buyers. Speaking of renovations, March is often the perfect time to make roof repairs. Why? It happens before those familiar April showers kick in and the outdoor temperatures are generally nice and cool. Having a portable garage on site can make getting a jump on those repairs easy. For instance, they could be used to store roofing materials or items that must be removed from the attic or crawl space during the repairs. Those are just three reasons why its a great idea to buy portable garages before spring arrives. To learn more, please contact us at Canopies and Tarps. 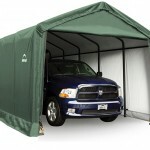 Weve got carport covers, replacement canopy tops, portable garages, roofing tarps, machine covers and more available now. So, we can have you ready to spring into action as soon as the first crocuses appear. This entry was posted in portable garages and tagged portable garage, portable garages on February 4, 2015 by CanopiesAnd Tarps. At about this time each year, many Americans start gearing up for the fall holiday season. Good examples are those folks that strive to have the biggest Halloween displays imaginable. They spend countless hours hammering nails, sawing wood and doing everything necessary to make decorations that will win them a spot on the nightly news or a Top 10 internet list. And if you find yourself bitten by the decorating bug too, weve got a tip to share. Portable garages make excellent workshops. Why? 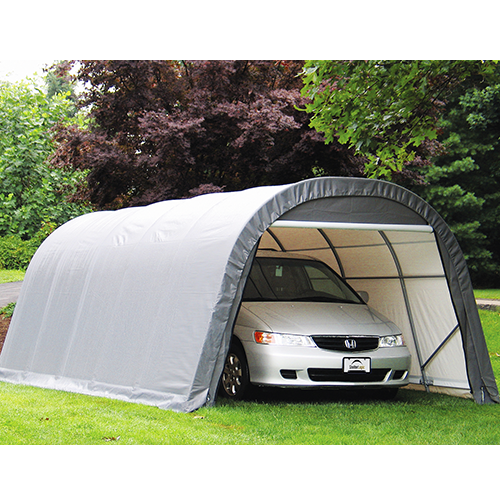 Portable garages are weather resistant and unusually durable. So the Halloween build sessions dont have to stop every time Mother Nature decides to unleash some cold, autumn winds or sleet upon the world. Just make sure that if you live in an area prone to ground frost that you set up the portable garages poles before the earth freezes solid. In addition to being weather resistant, portable garages opaque fabrics and roll-up door flaps provide secretive, holiday decorators with far more than a modicum of privacy. As a matter of fact, with todays portable garages at their disposal, crafty Halloween set designers can literally keep their display items under wraps until the day of the big reveal. They can also count on the portable garages to provide ample ventilation when needed. For instance, lets say that you need to paint a Halloween figure and are worried about pain fumes. Creating a cross breeze to push those fumes out of the portable garage is often as easy as opening up the door flaps. To find out more about setting up a seasonal workshop inside of a portable garage, please contact us. 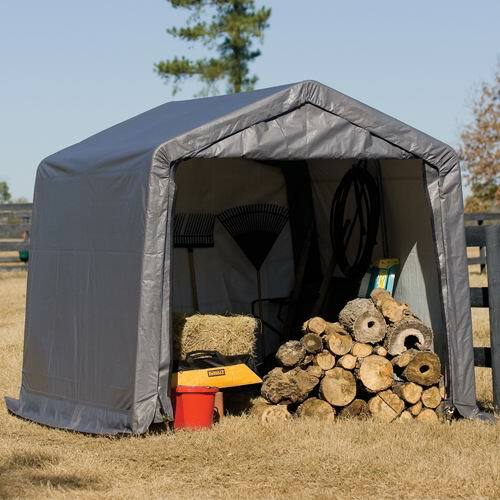 We have many different styles of portable garages available through our online store as well as welding blankets, machine covers, tarps, first aid kits and other items that may help holiday set designers. This entry was posted in portable garage, portable garages and tagged portable garage, portable garages on September 4, 2014 by CanopiesAnd Tarps. An increasing number of todays families are opting to bust out the bicycles and go cycling together. And considering all of the health benefits involved, who could blame them for donning those cycling shorts and helmets? Of course taking up cycling as a recreational hobby or professional sport requires an investment in equipment. One item that proves to be invaluable in that regard is aportable garage. Portable garages are ideal places to store cycling gear. Think about it. Todays bicycle frames are made from materials like aluminum, titanium, steel and carbon fiber. Despite being durable, none of those materials are totally immune from weather damage. The same may be said of bicycles wheels, drives, gears, braking and steering systems. They have the potential to rust, fade and degrade from exposure to the elements as well. Todays portable garages and sheds are uniquely designed to protect cycling equipment and more from damage. They typically feature heavy-duty frames that have been treated with DuPont thermoset powder-coated finishes to stand up to the wind and rain.They also sport triple-layer, rip-stop, heat-bonded, waterproof, polyethylene covers and Rugged Ratchet Tite Tensioning Systems. The covers tend to be treated with antifungal agents, sun damage and anti-aging blockers too. So they will hold up all summer long in a variety of different climates. To further strengthen portable garages and sheds ability to hold back Mother Natures fury, most come complete with steel foot plates and auger tie-downs as well. Thus, the chances that portable sheds and garages will blow over and leave a familys cycling gear exposed to the elements are slim. At Canopies and Tarps, cyclists have a wide variety of portable garages and sheds to choose from too. Some of the items in our collection, like the8 x 8 x 8 Portable Storage Shed, are immediately available for shipping. Other portable garages and sheds are custom made and thus require additional leeway when it comes to calculating shipping dates.To learn more about protecting your familys cycling gear with portable garages and sheds, pleasecontact usat (877) 811-3911. Wed love the opportunity to help satisfy your familys cycling equipment storage needs. This entry was posted in portable garages and tagged canopies, portable garage on May 15, 2014 by CanopiesAnd Tarps. Portable garagesset up in a flash and can be used in a variety of locations. They are also an ideal way to store your junk before you have a chance to dispose of it. For example, you could use one portable garage to temporarily set aside items to be sold online or at a neighborhood yard sale. Another portable garage could be used to store items that are waiting to be picked up by charitable agencies. Thats where the safety aspect comes in. Because portable garages are set up outside of the home, there is no need for a charitys pick-up crew to traipse through your living space. In addition, most portable garages do not feature locking mechanisms. So there is no need to leave a set of keys or wait around to open doors for pick-up crews either. Just tell the charity organizer which portable garage contains the items to be donated and then let them worry about the rest. Another great thing about portable garages andportable shedsis that they are not see-thru. Therefore, you wont have to stress over potentially receiving complaints or fines from people upset over seeing a huge junk pile in your yard. 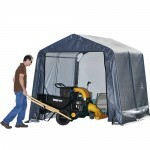 Just make sure that you dont need a permit before placing the portable garage in your yard. Otherwise, you may end up having to deal with angry members of your areas homeowners association or code enforcement agency. Once your spring haul out activities are through, the portable garages could very easily be used to store lawn and garden supplies. The kids could use them to neatly store their outside toys and recreation equipment too. To learn more about portable garages and how they can help you spruce up the place, pleasecontact usat (877) 811-3911. Afterward, please feel free to share your spring clean up and portable garage tips with us onFacebook. This entry was posted in portable garages and tagged portable garage, portable garages, portable tents on January 31, 2014 by CanopiesAnd Tarps.